Able Tree Care provides Manhattan tree services in Manhattan ZIP Code 10006. Call us when looking for the best tree service experts or a 10006 Tree Service Company. If you need tree service or tree care in Manhattan ZIP code 10006 then please call our local Manhattan tree company as our service team works 24/7 so you get the help when you need it most. 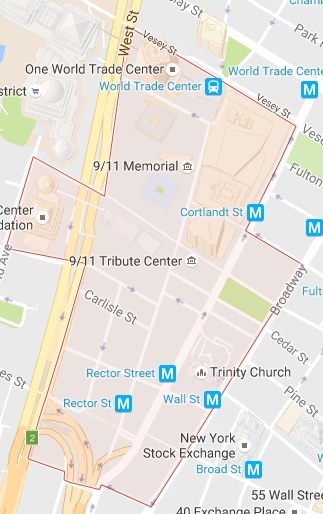 This is part of our service coverage area in Manhattan and we serve many 10006 property owners currently. Our local tree company provides emergency tree removal, scheduled tree inspections, and tree care service in Manhattan. 10006 – This part of Manhattan is home to the Freedom Tower, previously the world famous World Trade Center, and twin towers. This is home o Zuccotti Park, and the luscious grounds surrounding Trinity Church. This part of Manhattan isn’t the easiest to access by car, and when there is a need for tree removal in lower Manhattan very few tree companies can handle the job. When the city is in need of a Manhattan tree removal company that can get in and out fast, and safely, Able Tree Care gets the call. Many local tree companies in Manhattan do not have the experience or the machinery to handle large, dangerous tree projects. At Able Tree Care we own, never rent our heavy equipment which means we never have to wait for rental equipment to become available. We are the top tree company in Manhattan and we will prove it to you with our customer care and expert tree service every time. Property owners rely on us for all of their tree care needs. When you are looking for the #1 10006 tree service and want to hire the best tree company in Manhattan that provides safe and affordable tree services, which includes tree removal and tree cutting, then please give Able Tree Care a call now. We provide 24/7 tree service in Manhattan.